Let me start with this — I LOVE using Scrivener. It not only helps me stay organized, it also saves me a ton of time and gives me all kinds of ways to keep track of things in my stories. I get it — it might seem too complicated. You might ask “Is it really better than Word?” You might get a little overwhelmed not knowing where to start. But here’s the thing — if all you ever do is use it to write your story, you will still save yourself hours of time just by being more organized. No really, I mean it. Hear me out. 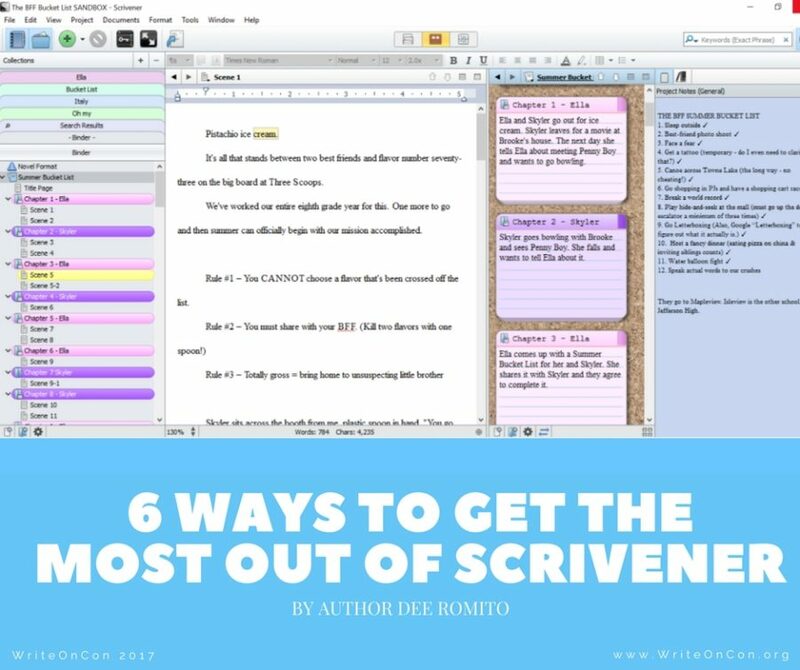 Whether you’ve never heard of Scrivener, you’re aware of the buzz, or you’re already a fan, here are six tips that will help you get the most out of the program. 1. Think of Scrivener as a trip to Home Depot. I start my Scrivener sessions off with this, because it’s important to look at learning the program the right way. Imagine walking into Home Depot and trying to learn everything about every single tool, in every department, all at once. Not only is it not necessary, but it would be very overwhelming. When it’s time to remodel your bathroom, you go to the bath department and get what you need. When you decide to paint your living room, you go to the paint department and choose your colors and paint brushes. The important thing is not using it all at once, but knowing where to find it when the time comes. The same applies to Scrivener. You do not need to learn it all at once. And you don’t have to use every tool. Just know there are more features available for whenever you’re ready to use them. 2. Get off on the right foot. Even advanced users can benefit from taking a step back and learning better ways to start their next project. If you go through your checklist before you start a new Scrivener project, the process will be much smoother. Check out my Getting Started tutorial to learn how to make just the right tweaks so you’re not wishing you could change the font or spacing in the middle of your manuscript. 3. Learn how to set up the Binder. Scrivener allows you to break your manuscript into parts — chapters, scenes — whatever you need. And here’s what makes it so valuable… they’re all right there! With one click, you can go from Chapter 1 to Chapter 24. You can move the chapters around. You can set up two scenes side by side using split screen and a couple clicks on the scenes you want. The Binder forces you to stay organized and keeps everything you need at your fingertips. I talk about how I like to set up the Binder in my Getting Started tutorial, but even if you just want to start writing and add chapter folders as you go, it’s very easy. 4. Use the simple tools. Before you even venture into the more advanced features, keep in mind that Scrivener has some simple little tricks that will help along the way. Three of my favorites are Project Targets, Name Generator, and Project Notes. Project Targets lets you set a word count goal for your manuscript and for your current session. It keeps track of your progress and even changes colors as you get closer to your goal. I love when I’m teaching a session on Scrivener and someone who’s been using it for years says, “I didn’t even know those were there!” Yup, they’re there, and they’re awesome. 5. Know what kind of writer you are and what tools you need. Which features will be most helpful also depends on your current project. Sometimes I color code, like when I use dual POV and need to see which chapters are being told by each character. Sometimes I use the Corkboard feature (okay, I always use the Corkboard feature) to see where in the story certain events happen. And sometimes I use keywords to track different storylines. 6. Play in a Sandbox. What I recommend for Scrivener users at any level is to create a project called “Sandbox.” It can be a brand-new project or you can use “Save As” to create a Sandbox version of a current or completed project. Whenever you want to try a new feature or play around with templates and tools, you can go to your Sandbox file. That way, you can learn to use any feature you want without worrying about messing things up. It’s a great way to learn the program and try out new things! * Keep in mind that the Windows and Mac versions are slightly different and sometimes use different commands. Mac users will have a few extra bells and whistles, but both programs do what you need them to. There’s also an iOS version if you want to write on your iPad or your iPhone! * One other important note. Remember that you can move files easily in Scrivener, but that means you need to be careful not to move them if you don’t want to, especially if you have a touchscreen. So, there you have it. Save time, get organized, and have a little fun along the way. Go ahead–go play! ​Dee Romito is an author and former elementary teacher. Her middle grade debut, THE BFF BUCKET LIST, is now available from Simon & Schuster/Aladdin with three more to follow in 2017-2018. You’re likely to find her on adventures with her husband and two energetic kids, at the local ice cream shop, or curled up in a comfy chair with her cats. Dee blogs at writeforapples.com and you can visit her website at DeeRomito.com. Very informative! I’ve been debating about whether to tackle Scrivener for awhile now. I love how you compared it to shopping at Home Depot because it’s the fear of being overwhelmed by new technology that has held me back. Taking small steps and only using what I need makes sense. Thanks! I’ve been toying with the idea of using Scrivener forever, but I have one concern: what happens if your computer crashes??? How difficult is it to back up documents? You can actually set it up to back up automatically every time you close the program! I have mine set up to back up on Google Drive. This is what I do, too! Google Drive, that is. *All* of my writing material is in cloud storage and backs up automatically the moment a file is saved. Since Scrivener autosaves every time you stop typing, that means I never have to worry about losing more than a sentence or two. Hi, Faith. You back it up the same way you’d back up anything else. It saves as a .scriv file which will open as long as you have Scrivener on your computer. You can save it on your computer or to a service like Dropbox. I also compile to a Word doc once in a while, just to have another back up. OMG, I can’t thank you enough for this Intro to how to use Scrivener!!! If it wasn’t for this WriteOnCon I may never have discovered this incredible tool. I will look forward to scouring your blog postings for more tutorials and thank you for sharing your love of this writer’s tool! !